The Ornithomimids ("bird-mimic lizards") or ostrich dinosaurs are theropod dinosaurs which bore a superficial resemblance to modern ostriches. They were fast, omnivorous or herbivorous dinosaurs from the Cretaceous Period of Laurasia (now Asia, Europe and North America), as well as Africa and possibly Australia The group first appeared in the Early Cretaceous and persisted until the Late Cretaceous. Primitive members of the group include Nqwebasaurus, Pelecanimimus, Shenzhousaurus, Hexing and Deinocheirus, the arms of which reached 2.4 m (8 feet) in length. More advanced species, members of the family Ornithomimidae, include Gallimimus, Struthiomimus, and Ornithomimus. The skulls of ornithomimosaurs were small, with large eyes, above relatively long and slender necks. 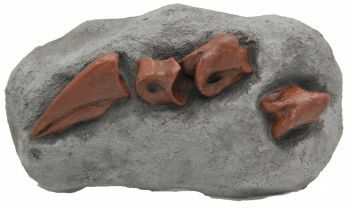 The most basal members of the taxon (such as Pelecanimimus and Harpymimus) had a jaw with small teeth, while the later and more derived species had a toothless beak. The fore limbs ("arms") were long and slender and bore powerful claws. The hind limbs were long and powerful, with a long foot and short, strong toes terminating in hoof-like claws. Ornithomimosaurs were probably among the fastest of all dinosaurs. Like other coelurosaurs, the ornithomimosaurian hide may have been feathered rather than scaly. Ornithomimosaurs probably acquired most of their calories from plants. Many ornithomimosaurs, including primitive species, have been found with numerous gastroliths in their stomachs, characteristic of herbivores. Henry Fairfield Osborn suggested that the long, sloth-like "arms" of ornithomimosaurs may have been used to pull down branches on which to feed, an idea supported by further study of their strange, hook-like hands. The sheer abundance of ornithomimids — they are the most common small dinosaurs in North America — is consistent with the idea that they were plant eaters, as herbivores usually outnumber carnivores in an ecosystem. However, they may have been omnivores that ate both plants and small animal prey.